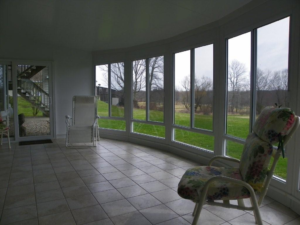 According to Wikipedia, Florida rooms or Sunrooms (also known as sun parlor, sun porch, patio room, Florida room, garden conservatory, or winter garden rooms) are spaces in homes designed to help home owners enjoy our outdoor environment, even during inclement weather. We don’t really refer to these rooms with these terms anymore, but almost every home in Florida has one. In almost every case, Florida rooms exist under a flat roof. Flat roofs are problematic because water can stand on them for several days and the water breaks down the roofing materials and causes roof leaks. These roofs are almost always asphaltic and conventional roof repairs can more often than not do the trick. If your back porch or Florida room is leaking and you think that just a roof repair is needed, contact us here. A new roof may be needed if roof leaks in your solarium room have been chronic. 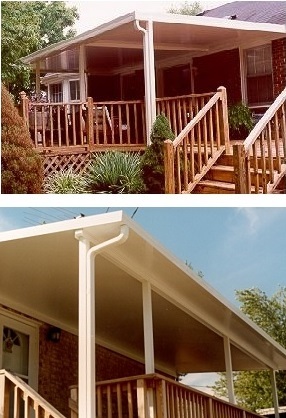 Call us and our expert estimators will come out and help you make a determination as to your need for a new porch roof. You can also check out our blog and see our philosophy as to when a new roof is needed over a roof repair. But when you decide its finally time to have a re-roof of your patio roof, call us and we can help you make the best decision on how to proceed. There are two options when contemplating a re-roof for Florida rooms, conventional asphalt or single-ply TPO. Preventive Maintenance Support Services Company is an expert in both. Check out our commercial roof service to learn more. Our company was established in 1994 and historically, we have leaned toward the time tested and reliable conventional asphalt roof. You just can’t deny that hot asphalt roofing (not to be confused with self-adhering, cold process or torch applied asphalt roofing. As an aside, we don’t recommend these techniques) has been used for hundreds of years and just plain works. In the 1970’s a new breed of flat roofing was invented and is referred to as “copolymer alloy” (CPA), “thermoplastic” or “single-ply” roofing. The evolution of this technology was not always pretty, but today, is very reliable. In fact, Single-ply roofing now represents almost 70% of the flat roof market. This fact alone dictates you at least considering TPO roofing for a re-roof of your Sunroom. Make sure you ask our estimator to explain which roofing system is the best choice for your Florida room and click this link to see a project profile of a new single-ply flat residential back porch re-roof.